MCLEAN, Va., March 28, 2019 /PRNewswire/ -- Iridium Communications Inc. (NASDAQ: IRDM) announced today the commercial service activation of a new southern hemisphere ground station, located in Punta Arenas, Chile. The addition of the Punta Arenas teleport network site adds geographic diversity to Iridium's ground stations as its only southern hemisphere site, establishing a new layer of network redundancy for the constellation. This new site strengthens an already exceptional space and ground network by enhancing Iridium's ability to manage network traffic, capacity and availability rates. 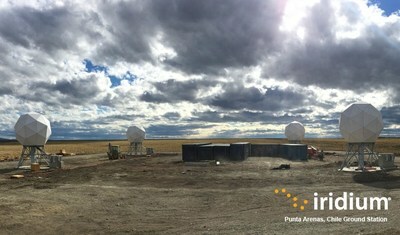 The Punta Arenas site was built in partnership with Kongsberg Satellite Services (KSAT) of Norway, a long-time Iridium partner in supporting celestial-to-terrestrial connectivity. Due to Iridium's unique status as the only low earth orbiting commercial satellite network to utilize intersatellite cross links, network traffic can be transferred in real-time along the most efficient route, now including this new southern site. These cross links automatically direct traffic from satellite to satellite and then down to a ground gateway. This feature helps make Iridium the world's first and only truly global network, enabling communication from remote waterways and mountainous regions to the north and south poles. "We'd like to thank our partners at KSAT and the Chilean government for helping us add this important southern hemisphere ground station to the Iridium network," said Walt Everetts, vice president, satellite operations and ground development, Iridium. "This move essentially creates a southern doorway for us to both access our satellites for any telemetry, tracking and control (TTAC)-related needs and to deliver data or carry phone calls, to and from terrestrial networks, through our primary commercial gateway." The Punta Arenas site now joins existing operational Iridium commercial ground stations in Fairbanks, Alaska; Svalbard, Norway and Tempe, Arizona. Due to the Iridium constellation's crosslinked satellite architecture featuring six orbital planes with 11 operational satellites per plane, the network provides a web of coverage around the entire planet, with minimal need for local infrastructure or ground stations. Iridium recently completed its $3 billion satellite upgrade campaign known as Iridium NEXT and launched the world's first truly global broadband service, which is designed for specialized applications, Iridium CertusSM. Iridium is the only mobile voice and data satellite communications network that spans the entire globe. Iridium enables connections between people, organizations and assets to and from anywhere, in real time. Together with its ecosystem of partner companies, Iridium delivers an innovative and rich portfolio of reliable solutions for markets that require truly global communications. The company recently completed its next-generation satellite network and launched its new specialty broadband service, Iridium Certus. Iridium Communications Inc. is headquartered in McLean, Va., U.S.A., and its common stock trades on the NASDAQ Global Select Market under the ticker symbol IRDM. For more information about Iridium products, services and partner solutions, visit www.iridium.com.